Agent for ESX(i) is deployed automatically during vCenter Server integration. See Acronis Backup & Recovery for vCloud: Integrating Acronis Management Server with vCenter Server. If you disabled the automatic deployment, deploy the agent to every ESX(i) cluster whose virtual machines will be backed up. If a cluster contains a large number of virtual machines, you may want to deploy additional agents to this cluster, regardless of the automatic deployment setting. Connect Acronis Management Console to Acronis Management Server. Right-click the IP address or name of the vCenter Server for the resource group. 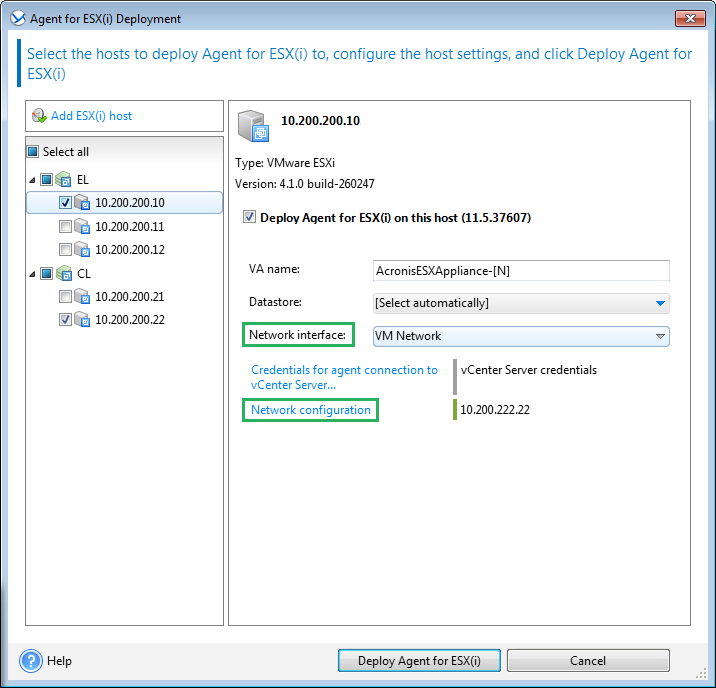 Click Deploy Agent for ESX(i). Select a host to which you want to deploy the agent. In Network interface, select the network interface that provides access to the Acronis Management Server, the vCenter Server for the resource group, the cluster virtual machines, and the backup storage. The Network configuration link enables you to select whether the agent will use a dynamic (provided by a DHCP server) or a static IP address. If you want to leave the default setting to use the dynamic address, skip this step. Select Use the following network settings. Specify the appropriate network settings for the agent, and then click OK.
You will be able to change the network settings after the agent is deployed. To do so, select the virtual appliance in VMware vSphere inventory and go to the virtual appliance console. Under Agent options, click the Change link next to the name of the network interface, such as eth0. Once the agent is successfully deployed, the agent machine appears in the Machines with agents view of the Acronis Management Server.